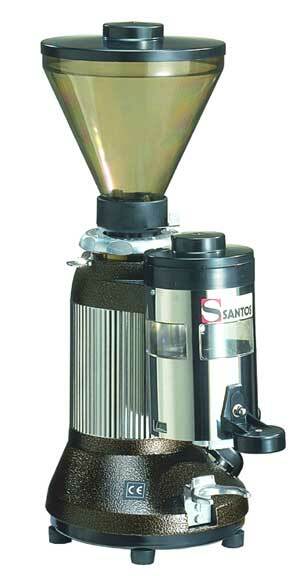 Europe's leading brand, Santos, is now available in the USA. This commercial coffee grinder is perfect for heavy duty use in restaurants, hotels, bars, schools, assisted-living facilities, nursing homes, hospitals, cafeterias, coffee shops--anywhere large quantity coffee grinding is required. The single-phase motor has thermal protection. The construction is stainless steel and alimentary aluminum alloy. Weight: 22 lbs. Dimensions: 22 inches high X 9 inches wide X 14 inches deep. The 63.5 millimeter diameter tempered steel grinding discs are long lasting and easy to change. There is a wide range of precision grinding selections from coarse (for use with a coffee filter) to very fine (for espresso). Average output: 20 lbs. per hour. Includes a distributor with dosage device and counter. Adjustable portion of grinding per cup. Paint color of exterior of machine is brown. Also available in grey painted, or chrome. Call to specify color.